A flat route out to Birkin Fisheries cafe and back of approximately 30 miles. Everyone welcome on any road-worthy bike (a cycling helmet must be worn). Paced to accommodate all riders, nobody left behind. Build your fitness, experience group riding, make some new cycling friends. ? Have a look at the ‘what to bring’ and ‘getting started’ tabs here https://www.seacroftwheelers.co.uk/rides/ for some helpful tips and advice. The ‘ride smart’ videos are also worth a watch on the same page. You don’t need to bring everything on that list to this ride – cycling helmet, water bottle, an inner-tube and some cash for the cafe will suffice. We can assist with any mechanicals/tool requirements. 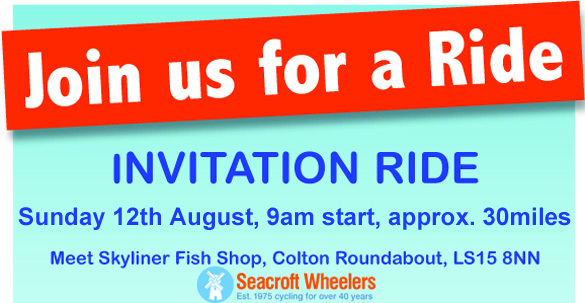 Please note: On all Seacroft Wheelers rides (in line with British Cycling guidelines), all under 16s must be accompanied by a responsible adult and under 18s must supply a signed ParentalConsent form. If you would like to attend, but don’t have a bike and can’t borrow one, then Leeds Bike Mill is an option. They sell recycled bicycles with prices starting from £70, see link for details. The Bikes College – is another option for buying a recycled bike. Yorkshire Bike Libraries may also be an option for borrowing one. As well as the more obvious connection between exercise and health “Improving your physical well being can help you feel better about yourself”.